As one of the state's largest regions, will Cincinnati keep getting bigger? Cincinnati is one of the three largest regions in Ohio, and evidence shows it's just going to keep getting bigger. Signs of growth can be seen in economic and housing developments Downtown, in neighboring counties and in Northern Kentucky. "In our area, what I mostly see is urban growth," said Tomasz Stepinski, professor of space exploration and geography at the University of Cincinnati. Cincinnati is one of the three largest regions in Ohio, and evidence shows it's just going to keep getting bigger. Signs of growth can be seen in economic and housing developments Downtown, in neighboring counties and in Northern Kentucky. "In our area, what I mostly see is urban growth," said Tomasz Stepinski, professor of space exploration and geography at the University of Cincinnati. Stepinski recently used satellite imaging for global mapping research that shows worldwide changes over nearly 25 years. Through his mapping technology, he zoomed in on the Cincinnati-Dayton area, which shows significant changes from 1992 to 2015. Large concentrations of red, which indicates urban growth, blossomed throughout the region. "Cincinnati is growing mostly north, and Dayton also is growing," he said. "So the space which previously was agriculture between Cincinnati and Dayton is shrinking." The same growth is also on the radar at the Ohio Kentucky Indiana Regional Council of Governments. "Currently, of the 2 million people who live in this region, 60 percent of them live within 5 miles of the I-75 corridor," said Mark Policinski, CEO of OKI. OKI has a demographer projecting Tri-State growth for the agency's 2050 Transportation Plan. They already have some preliminary results. "We're going to see a 10 percent growth in our region over the next 35 years," Policinski said. That translates to around 200,000 new people, which he said is considered steady growth for the area. "We're very fortunate to have this," he added. 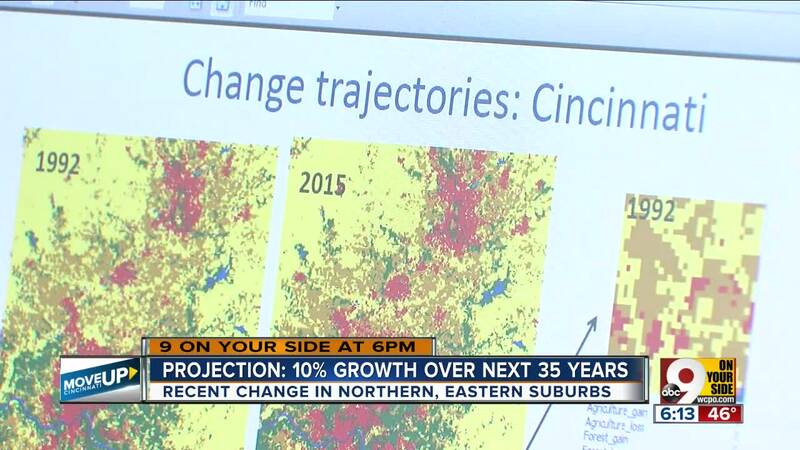 "Most places in Ohio are not experiencing growth over the next 35 years." There is also the possibility that the Tri-State could grow even more over the next several decades. Policinski points to the additional jobs anticipated at the Cincinnati-Northern Kentucky International Airport, which could attract even more people to the region. "It might be a little higher because we're seeing some dramatic improvements made around the airport when it comes to Amazon Prime locating here (and) DHL is expanding," Policinski said. Groundbreaking on the Amazon's $1.4 billion air hub is expected in 2019, and the project should add more than 2,700 jobs to the region when it opens. The megaretailer already has a fleet of air cargo planes filled with packages and flying from CVG. "The biggest challenge that we have now, and it'll only worsen whatever growth we have, is that we have to find a way to get people to work efficiently," Policinski said. He admitted the local transit system needs improvement, and he wants to see how technology can play a role. "With what's happening in technology when it comes to the transportation industry now, certainly transit is going to be one of the primary targets," he said. Meanwhile, the final outcome of the 2050 Transportation Plan will also look at the relationship between population growth and commute times, transportation methods and emissions. The plan will also be important in determining which local projects will receive federal funding over the coming years.